Hi Lieve, thanks for the response. I was working on sizing and positioning placeholders for a number of master slides. For example, a graphic placeholder over the top of a computer graphic where a user can add the screen content of their choice. I wanted to be able to specify a specific size of graphic in pixels. Not a big deal. More of a force of habit for me. For a responsive project? Be careful with placeholders, except for the text placeholders I find most other placeholders totally unusable. Graphic placeholders will cause inserted images to distort to match the size of the placeholder. Such a placeholder may make sense for a non-responsive project, but for Breakpoint views? Inheritance is top-down, you would have the exact same size in between breakpoint views, mostly not what you want. I see what your saying. My work around involved using a specific graphic size to match the aspect ratio of the placeholder, and then documenting the measurements. That’s why I was being so particular about using the pixel option for positioning / size. The background was different matter. Instead of adding a custom background in Properties, I imported a graphic into the master slide and then manually resized it in the various views. Jim, you’ll need a lot of testing on different devices, and you could get frustrated by your approach with fixed sizes…. Hi Lieve, thanks for the feedback. 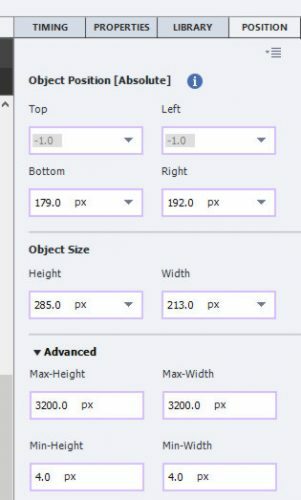 Position properties are used for responsive projects, Breakpoint views and for Fluid Boxes setup in CP2019. I really don’t understand why you want them to be in pixels. Personally only in 1 out of 100 situations will I ever use absolute units (px) in a responsive project. Maybe some misunderstanding? There is a very logical reason why the rulers (from which you can drag guides) are in % when you are in a responsive project. They are only in px in a non-responsive project.